Statutory information – All states require that Special Education teachers have a license for public schools. Some private schools may or may not require the state license. Qualifications and relevant experience – All states require Special Education teachers to have a Bachelor’s Degree qualification to teach in both private and public schools. Personal summary/ profile – This section is an introductory paragraph describing you and your work. Skills – For Special Education teachers, this can be a particularly complex section, and you may need to manage your space with layout options like callout boxes or bullet point lists. Make sure that your skills section fully addresses the requirements of the jobs for which you apply. Mandatory information and documentation – This section needs to show all required documentation. List your qualifications, license, and certifications as specified by the job’s requirements. Work history – This part of your application will need to show appropriate levels of experience and depth of experience. Special Education teaching roles can be very demanding, and standout applicants are those who can demonstrate practical abilities and achievements. Luckily you can follow these tips when you start writing any school teacher resume. The good news for Special Education teachers is that the functional resume format is very easy to work with. What’s more, it’s basically the best resume format. But don’t underestimate the level of difficulty in putting together a good, competitive resume. Superior skills – Use your Skills section to show your advanced and most high-value skills in context with the requirements of the job. Cite achievements, productivity, and skills values. Focus on job-specific skills and “degrees of difficulty” to show your range of skills. Experience and knowledge base – Special Education teachers need expertise and practical knowledge. These are the areas where you can really show your abilities and the high-quality practical values schools need. 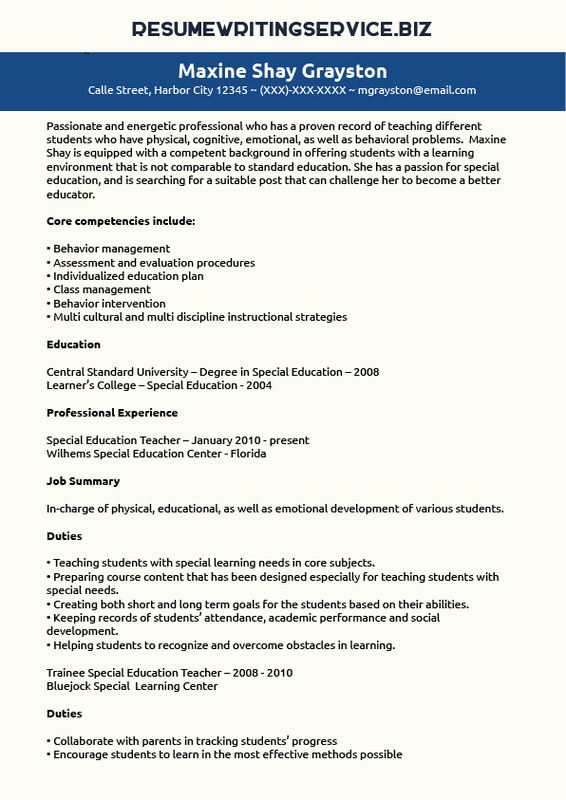 For a special education teacher resume, feel free to contact us now!